Kate Jackson has survived a cobra bite and a rare tropical disease while building the only online database of the snakes of Western and Central Africa. Her research will save lives. And it could prevent mining companies from destroying the Congo. Four days after herpetologist Kate Jackson first visited the Republic of the Congo, a civil war broke out. On subsequent trips to the former French colony to research the snakes of Western and Central Africa, she weathered a team mutiny, suffered from malaria and had to be medevacked to neighboring Cameroon. “In 2006 I got bit by a cobra, but aside from that the trip was fine,” Jackson said while sitting in her office, two Rubber Boas slithering through her right hand into a tangled knot. Jackson paddles a pirogue, a dugout canoe, to check her nets in the Likouala aux Herbes River in northern Republic of Congo in 2008. The dead snake in the pirogue is a water cobra (Naja annulata). While the assistant professor of biology might dismiss a cobra attack as no big deal, what struck her down after returning to the United States cannot be casually brushed aside. Whitman had just hired Jackson when her legs stopped working. After numerous medical tests, an infectious disease specialist at the University of Washington informed Jackson that, while in the Congo, she had become infected by an unnamed tropical virus that left her legs paralyzed. Thankfully, her nerves slowly regenerated, and two years later she could finally walk without crutches or leg braces. It’s difficult to keep Jackson out of the field. Before completely healing from her mysterious virus, Jackson returned to the Congo in 2010 for the fifth time, her legs supported by bulky braces. There, she dug in the muck and the mire, searching for serpents in the Congolese swamps. After all she’s endured studying reptiles that make most of us shudder, why does she risk her health traveling to backwater jungles to research snakes? “I went to the Congo to try and protect the amphibians and reptiles from the mining,” she said. The Wildlife Conservation Society invited Jackson back to the Congo to explore the Massif du Chaillu region, which stretches from western Congo along the Gabon border, because large swaths of this land are scheduled to be mined. “It was a chance to hopefully do some good by documenting the reptiles that live in the region,” she said. “The plan is to mine this area, so I needed to show what species live there” to convince the mining companies that certain areas needed to be protected. A juvenile Nile monitor lizard (Varanus niloticus) nips at Jackson’s hand during the 2010 Zanaga expedition. Jackson was the first person in the world to photograph Günther’s Black Snake (Bothrolycus ater), an extremely rare African snake. MONSTER-SIZED BULLDOZERS driven remotely by satellite GPS systems will soon be carving giant roads through about 1,850 square miles of Congolese jungle where Jackson conducted much of her field work. The multinational Zanaga Iron Ore Company, along with Xstrata, one of the world’s largest diversified mining companies, plans to develop the Massif du Chaillu region in order to harvest the mineral deposits buried within the reddened soil. “We documented the myriad species thriving in this virgin wilderness, not as a means to stop all development, but to instead bargain for a land swap,” Jackson said. Once iron ore, diamonds or other natural resources are discovered, bulldozing untouched wilderness becomes inevitable, but by revealing the varied ecosystem, the WCS hopes to force ZIOC and Xstrata to preserve part of it. If the mining companies want development loans from the World Bank Group, the companies will take Jackson’s biodiversity study seriously. The WBG is the largest biodiversity funder in the world. Between 1988 and 2009, the bank’s biodiversity investment portfolio exceeded $6.3 billion, and the WBG has worked directly with 122 developing countries to protect and manage wildlife. “Our study might force the mining companies to take mitigating measures like buying up an area of habitat and creating a national park along the border between the Congo and Gabon. “They try to get national parks on borders so if one country has a civil war, the elephants can run to the other side,” Jackson said jokingly. Jackson’s research has proved the Congo is full of rare and endangered species. One such species living in the swamps scheduled to be deforested is Günther’s Black Snake (Bothrolycus ater), an obscure African snake unique in that it has the presence of unusual openings on the side of the face, just in front of the eyes. The snake is so rare that it had never been photographed alive, until Jackson captured the 23-inch-long serpent on her Canon camera. “I was very excited, of course, once I realized what the snake had to be,” she said. SNAKEBITES. The World Health Organization estimates that up to 94,000 deaths result from snakebites worldwide each year. Many of these deaths occur in sub-Saharan Africa. Jackson shows children a juvenile African Rock python that was accidentally caught in a fish trap in the town of Impfondo in 2005. How does one fight snakebites? Anti-venom. Conservation zones safeguard habitat, but they also are important because the reptiles living in these national parks, Jackson insists, can save lives. And this is where Jackson’s research and new database help. Jackson is a world expert on Western and Central African snakes. In fact, she’s the go-to herpetologist for identifying these creepy creatures, and she routinely receives emails from colleagues asking her to judge whether or not snakes found slithering through their campsites are dangerous. Having received hundreds of emails asking for her help recognizing venomous snakes, Jackson decided to use her research to develop an easily accessible, online database to identify the snakes of sub-Saharan Africa down to the genus level, so now when a snakebite victim is hustled into a medical clinic, the doctor can figure out which kind of snake it was and which anti-venom to use. “The ‘Snakes of Central and Western Africa’ database provides the information, tools and training necessary for African medical professionals to make expedient snake identifications, which are necessary for treatment of snakebite,” Jackson explained. 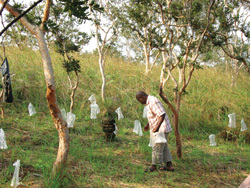 Ange Mboundou-Louika washes plastic bags used to collect frogs to test for chytrid fungus, which kills amphibians. Once washed, he hangs the bags out to dry around Jackson’s woodland savanna campsite. The database is a companion to her forthcoming book, also titled “Snakes of Central and Western Africa,” which covers 26 countries and almost 300 species of snakes. Because of the inherent dangers of traveling within the Congo, Jackson’s Whitman students don’t follow her on research trips. “She takes more risks than a lot of other people,” said Kevin de Queiroz, a research zoologist at the Smithsonian’s National Museum of Natural History, in an interview with The Scientist, a magazine devoted to the life sciences. But “the field work she does in remote places is very important for the study of biodiversity and for conservation,” de Queiroz said. THE SNAKE PIT is what Jackson calls her office. The name makes sense, as the cured leather skin of a deceased African Rock Python (Python sebae) hangs above her door. The aquarium in the corner of her office houses her Rubber Boas, which she has affectionately named Lewis and Clark. However, the photo on her computer of an East African Red-Black Striped Snake (Bothrophthalmus lineatus) regurgitating a field mouse has been replaced with a picture of her new baby, Robin. Despite recently becoming a mother, Jackson plans to continue braving the Congo’s hazards, because her snake research saves lives. Back in 2006, it was the bite of that pesky cobra that possibly saved her from succumbing to the tropical virus, which caused her to suffer from the neurological disorder known as transverse myelitis, and left her teaching her biology classes in a wheel chair until her nerves recovered. 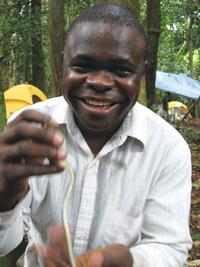 Ange Zassi-Boulou holds a Collared Marsh Snake (Natriciteres fuliginoides) at the campsite. Congolese graduate students helped Jackson conduct the Zanaga survey. “I’ve never been treated with snake venom in any organized medical way,” Jackson said with a laugh. By “organized medical way,” Jackson means that her doctors didn’t use anti-venom to treat her illness, which it turns out she picked up from shrew bites she endured while camping in the Congo. However, molecules called nerve growth factors have been identified from cobra venom. A future medical application might be using this venom for a medication that could help people who have suffered spinal injuries or other types of nerve damage – including the spinal damage Jackson suffered from her disease. Pharmaceutical companies are developing drug therapies that use snake venom to treat heart disease, cancer, Parkinson’s disease and Alzheimer’s disease. Those who suffer high blood pressure are already indebted to venomous snakes. Jackson said “a number of snake venoms create a transient condition of depressed blood pressure in envenomed patients.” In other words, if bitten by a rattlesnake or a copper head, your blood pressure drops. This fact has lead to breakthrough medicines, such as angiotensin converting enzyme inhibitors, which save millions of lives. These ACE inhibitors alleviate high blood pressure, and some of the first ACE inhibitors approved by the FDA were developed using an enzyme isolated from the venom of the Brazilian pit viper. Jackson warns that strip mining, deforestation and rapid development threaten the very snake populations on which hopes for new venom-derived medications depend, especially the snakes living in sub-Saharan Africa. Jackson’s snakes. “Biomedical researchers, pharmacologists, clinicians, herpetologists and conservation biologists must combine their efforts if the full potential of snake venom-derived medications is to be realized,” she argued.